So here is Mr. Cute Everyman learning parkour. Adorable. Wouldn’t we all would like to be the next Jackie Chan in our dreams…have those skills and flit through the cityscapes so effortlessly and dramatically. I’ve written about this sport (also called freerunning) a few times. Now I am imagining going to Brooklyn and trying it out. 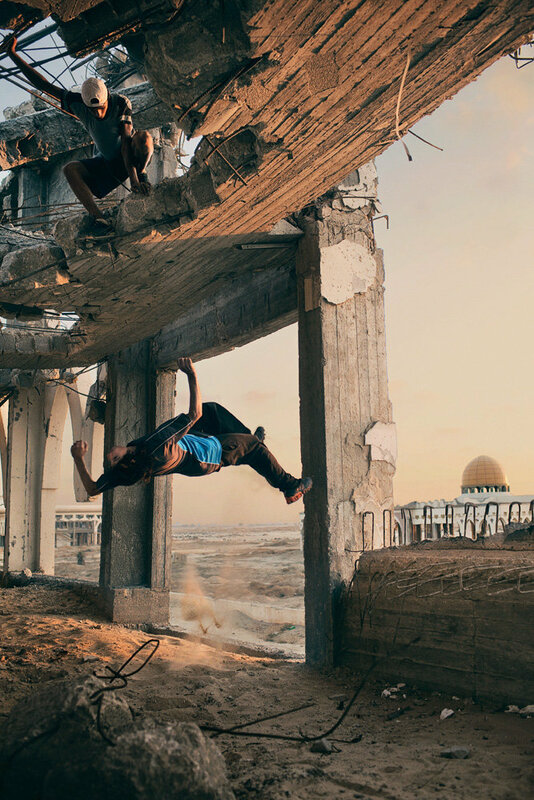 Here is another article about parkour, or freerunning, but this time it is about 30 kids doing it in the ruins of Gaza. They learn techniques from the internet and dream of going to an upcoming international competition in Miami next year. Ahmad al-Jakhbeer and Enshasy perform gravity-defying acrobatics in the ruins of the Gaza International Airport about eight miles from their home in a refugee camp. He and Jakhbeer, 22, are wary of straying too near the Hamas training zone, just as they are wary of leaving their homes when Israeli drones appear in the sky over their cinder-block refugee camp. They prefer the comparative safety of their daring leaps and bone-shattering landings. They believe that, one day, their ticket out of Gaza will be written by parkour. According to Jakhbeer, parkour helps untangle the “anger and depression” that comes with living where they do. Indeed, nowhere could a philosophy of escape and freedom have a greater resonance than in the narrow, politically and militarily confined Gaza Strip, home to a boxed-in population of 1.7 million Palestinians. Though the only Israelis Jakhbeer and Enshasy have ever met are settlers and soldiers, at whom they threw stones as children, they say they can separate their feelings about Israel’s politics from its people, to whom they bear no ill will. They see themselves as athletes first and not political figures of any sort. One obstacle to their ambition to be professional athletes is pressure to get a job, not easy in an area of high unemployment. Jakhbeer, in particular, says his family is nagging him to start bringing money in. For the moment he has managed to resist and to continue devoting himself to parkour. Parkour originated in the suburbs of Paris and is a corruption of the French word “parcours,” meaning route or journey. In a very literal sense, the sport is about overcoming barriers, living beyond the restraints of physics. It inspires a philosophical outlook on life that mirrors the actions of its athletes. If you want to learn more about this sport, check out some earlier-posted videos here. I’ve always admired freerunning, which is a form of urban acrobatics in which participants, known as free runners, use the city and rural landscape to perform movements through its structures. They may jump from building to building, scale walls, do flips and twists and many other amazing and death-defying maneuvers. I loved watching Jackie Chan climb up buildings in his martial arts films. Now there are thousands of kids—following in his footsteps…no make that flight steps or flight patterns. And the video above shows some free runners in TV, movies and commercials. Free running was derived from a French activity called “parkour,” which is neither a sport nor a competition. It is the efficient movement of the body through space. But there is much confusion between the two, some say the terms are interchangeable, while others point out that free running has many spins and flips that are unnecessary though very showy or stylistic…a more creative expression of the jumper. The second shows jumping from 1″ wide pole to another 1′ wide pole (at 1:57), and I just don’t grasp how this is possible…unless they missed it 20 times and included the one success in the video. Are you ready to run and fly freely, like a human with wings? You are currently browsing the archives for the freerunning category.